This would be a good place to acknowledge that Hollywood first turned me on to many of the historical persons and events that now fill some of my shelves. Certainly my books on frontier icons Davy Crockett, George Custer, Wyatt Earp, Billy the Kid, and Jesse James owe their shelf-feet to productions starring Fess Parker, John Wayne, Errol Flynn, Hugh O’Brian, Burt Lancaster, Clu Guluger, and Tyrone Power. My father did not talk much about his World War II experiences (which gave him a bomber-load of medals, including the Silver Star with Oak Leaf Cluster). My interest in WW2 was stirred by the many postwar combat movies, but the footage that influenced me most was found on the weekly documentary series on CBS, The Twentieth Century, hosted by former front-line combat reporter Walter Cronkite. Another Walter, Disney by name, fed me a steady and welcome diet of historical characters, including Elfego Baca (played by Robert Loggia), “Texas John” Slaughter (Tom Tryon), and Francis Marion (a pre-Airplane/Police Squad Leslie Neilson portraying Marion as a combination Davy Crockett and Scarlet Pimpernel, as this lyric attests: “Swamp Fox, Swamp Fox, tail on his hat, nobody knows where the Swamp Fox is at.”). I’ve only purchased Marion’s biography, but the Baca and Slaughter stories presented by Uncle Walt deepened my interest in the historical West. Disney also turned me on to another fox, Don Diego de la Vega’s alter ego Zorro. I was so captivated by Guy Williams’ dashing performance, that I was never able to accept him in any role without his signature mustache. For that reason alone, I could not abide Lost in Space. I mentioned above Tyrone Powers’ Jesse James and Errol Flynn’s Custer, but it was their swashbucklers that I had a young viewer’s passion for, even more than westerns. I had the good fortune to be around for Hollywood’s answer to the television set: the widescreen epic. The “cast of thousands” movies thrilled me, as they did others with fertile young minds. But they did something else. They sent me to the library, or, in one case, to my sister’s room. She had evidently seen the Kirk Douglas film, “Spartacus,” because she came home with the glossy tie-in book. I’m sure there were pages devoted to the stars, director, cinematographer, etc., but the pages that stuck in my mind were those devoted to explaining and illustrating (though screen shots), the Roman way of making war. I’ve since purchased dozens of books on Greece and Rome, and read more, but this movie tie-in gave me my start. Movies about Roman legions, swashbuckling swordsmen, quick draw lawmen and bombing runs over Tokyo did more than spur my reading and purchase of books on these and related topics. These and other films generated a lifelong interest in how my favorite movies and programs were made. Even after culling, I still own several shelves of books on various movie genres, television programs, actor filmographies, and the oeuvres of directors and producers. Books about Westerns and Western stars take up the largest share, followed swashbucklers and other costume dramas, historical epics, comedies, science fiction, and musicals, in that order. My most recent film book is A Splurch in the Kisser, a survey of Blake Edwards’ career. 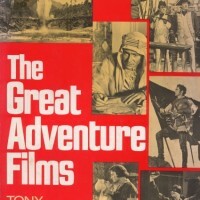 My most dog-eared volume is Tony Thomas’ Great Adventure Films, one of the many outstanding surveys of Hollywood published by Citadel Press, back when they used to do that sort of thing. Perhaps the most important film book I have, the one that refuses to follow the pack, is George MacDonald Fraser’s Hollywood History of the World (1988, revised 1966). I own a half-dozen similarly titled books, and they all say the same thing: Hollywood gets everything wrong. In fact, that’s the conventional wisdom every time a historically based film is released. Newspaper articles bullet the many errors found in every such movie. Attendees in discussion websites harp on all the mistakes made. Fraser (screenwriter of the star-studded Three/Four Musketeer films of the mid-70s and author of the twelve Flashman novels) suggests something different. For an industry whose sole purpose is to make money through entertainment, isn’t it amazing how much it gets right? We, the public, know an awful lot about the way people in distant times and lands looked, behaved, dressed, dined, and made war because Hollywood took the time to research the past. Two-hour movies are works of fiction. Compression and transposition of characters and events are necessary. Changes to who did what to whom are absolutely necessary to enhance the dramatic and visual impact. We can rightly complain when filmmakers fail on that score. But sheesh, so what if Lawrence was a lot shorter and homelier than Peter O’Toole? So what if people and actions are turned around to fit the needs of the screenplay. We still understand a lot of how the Revolt in the Desert was won and how imperial Europe’s needs in the Middle East screwed up the future. Perhaps no performance did more to interest me in a historical person than did O’Toole’s in Lawrence of Arabia. I’ve seen the film every single it was released to theaters, and have purchased it on VHS, DVD, and Blu-Ray. I bought my first biography of T.E. Lawrence, a small paperback by Anthony Nutting either just before or after I first saw the movie. Nutting, the author of Lawrence of Arabia: The Man and the Motive (1961) was an adviser on the Lean film. I’m sure that my pre-teen brain no more understood the psychology of Lawrence offered up by Nutting than I did the Oscar-robber performance of O’Toole. I eventually purchased three more bios, including a bloody awful psycho-babble take, the estate-authorized bio by Jeremy Wilson, and, finally, Michael Korda’s Hero: The Life and Legend of LoA (2010). It’s the first book I’ve read that makes sense of this extraordinary and tortured genius. Read it.